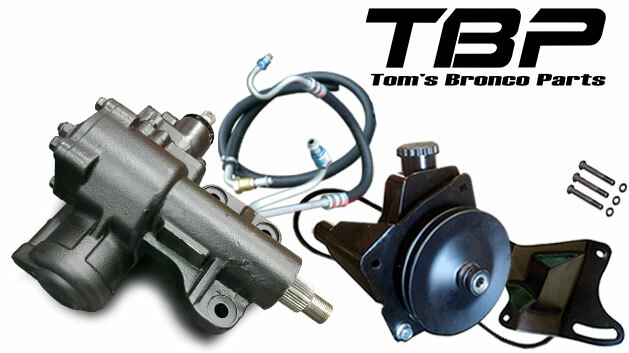 This Power Steering Kit w/Close ratio steering box will replace an existing faulty or outdated power steering setup for 66-77 Ford Broncos or can be used as a starter power steering conversion kit if you're looking to do your own custom steering shafts & pulleys. This Close Ratio Power Steering Conversion Kit eliminates your 6.75 ratio manual steering box or upgrades your stock 1972-77 power steering system. This power steering box bolts to the stock holes with no drilling required. This steering gear also retains the stock pitman arm and no steering geometry is lost. NO BUMP STEER! Please select your engine from the drop-down menu to ensure proper mounting bracket & hardware is sent. Fits 1966-77 Ford Broncos. *For 72-75 factory power steering, you will need to purchase a new lower steering shaft as well. This is because the original u-joint on the factory 72-75 Bronco steering box is longer than the replacement u-joint couplers that are available, causing the overall shaft length to be too short. br>If Bronco had factory Manual Steering small modifications may be necessary to Core Support.